The leaves have fallen, snowfall has commenced, and the best time of the year has finally arrived — the “sweet spot” for Oscar contenders. October through December have proven to be the most influential months to release the greatest Oscar-nominated films. With each year, it seems that more films are becoming more diverse and inclusive whether it be seen through its cast, its creative team, or its storyline. Since Moonlight’s monumental success in 2016, we’ve also seen Call Me by Your Name in 2017 and for 2018, it appears that the next biggest contender will be Boy Erased. 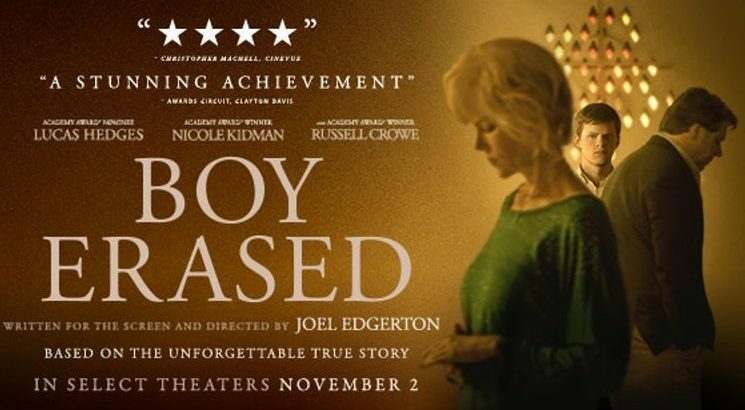 Not only does Boy Erased put LGBTQ at the forefront, but it also attempts to address a challenging topic. Boy Erased is a film based on Garrard Conley’s memoir. It tells the story of a teenage boy whose religious-bearing parents enroll him in a conversion therapy camp. Throughout the film, we see minimal glimpses of Jared Eamon’s past. In a rather typical nature, Jared portrays a generalized heterosexual lifestyle as a high schooler. He plays on the basketball team, has a cheerleader girlfriend, and is encouraged to spend time at his girlfriend’s house to avoid freezing up “when the time actually comes.” In a relatively understated scene, we get the first glimpse into Jared’s uncertainty and battle with his sexuality where he swiftly rejects his girlfriend’s sexual attempts and counters it with his religious morals. During Jared’s college career, it is apparent of his crush on a peer who he frequently spends time with outside of class. However, this relationship led to a painful and terribly disturbing sexual assault scene. Following Jared’s assault, his assaulter, Henry, falsely claimed to be a school counselor as he called Jared’s mother to inform her of his “behavior.” When confronted of his sexuality by his parents, Jared initially declines then later returns to confess that he is indeed gay. In a firm tone, Jared’s father asks him if he wants to change, which Jared responds with compliance and the desire to change. Marshall (Jared’s father), a Baptist minister, insists on enrolling Jared in a conversion therapy program. Upon his arrival at the camp, it seemed like he was arriving for a jail sentence. All of his belongings were taken, stored away in a cabinet, and informed that notebooks, phones, etc. would be monitored. In a typical motherly fashion, Nancy expressed some uncertainty and discomfort with dropping her son off. Jared initially accepts the principles of the “Love in Action” program conducted by former LIA participants. The program utilizes Christian principles to define their sexuality as a sin that they willingly chose to make. Through various activities, Jared quickly acknowledges that these exercises are nothing short of psychological and physical abuse. Aside from the societal (and even political) significance of this film, it suffered most from its cinematic elements or lack thereof. The entire film was centered solely between Jared and his parents, Nancy and Marshall. They were presented as a wholesome, loving family. Throughout the film, it is evident that Jared has had a decent upbringing where he expresses his understanding of moral beliefs. Furthermore, it seems that his parents are presented as fairly innocent throughout — as in, they deeply love their son, but his “choice” is simply against their beliefs and is not to be accepted. My only caveat to this was in what I found to be the most powerful scene throughout the entire film. Following Jared’s dramatic exit from the camp, we watched a raw scene between Jared and his mother. Played by the skillful Nicole Kidman, the dialogue was extremely moving and emotional as she spoke with regret on sending him to the camp and explained her intuitions of a mother. For this film to have tackled such a sensitive topic, it lacked the power of evoking emotion, especially where it had the most potential. Many scenes that felt important were presented in such a way that you knew they were intended to progress the story but did not punch the audience as it could have. Moreover, the film also failed to capitalize on its supporting characters. Since so much emphasis was placed on Jared and his parents, the purpose of other characters was confusing in retrospect. Consequently, when presented with extremely emotional instances from other characters, the audience could not empathize as much as we should have simply because the other characters weren’t given an adequate chance to be developed. In conclusion, this film represented an important subject matter and was successful in that regard. However, its quality of filmmaking is what will hold this film back from being amongst the most competitive Oscar contenders that follow. Boy Erased is inevitably a heart-wrenching film to sit through but its relevant purpose should not be ignored. PREVIEW: Can You Ever Forgive Me?